At many schools where boycott and divestment campaigns have taken place, J Street chapters provided key assistance to BDS activists through statements, lobbying, and activism that fueled the anti-Israel climate on campus and reinforced accusations against Israel made by BDS groups. Despite J Street claims that the group is an important progressive opponent of BDS, at many schools J Street chapters did not oppose BDS campaigns and sat on the sidelines during contentious fights over student government divestment resolutions. The revelations, compiled from Free Beacon interviews with campus activists and pro-Israel professionals who fought BDS resolutions this year, call into question the group's publicly claimed opposition to the BDS movement. Catie Stewart, deputy director of J Street U, recently boasted that her organization "does not support Israel Apartheid Week or BDS campaigns and joins anti-BDS coalitions." This year's campus fights suggest a different record. At the University of Minnesota, where a BDS referendum succeeded in March, a pro-Israel coalition launched a campaign to oppose the vote. J Street U refused to participate in the effort, instead releasing a statement condemning the campus Hillel for being insufficiently anti-Israel. The president of J Street U at UMN, Imogen Page, is a donor to Jewish Voice for Peace, a BDS group that endorses terrorism and calls for Israel's destruction. Page was seen handing out anti-Israel flyers during the voting period of the referendum. Weeks later, she was arrested for disorderly conduct during an anti-Israel protest staged by a different BDS group. A similar approach was adopted by the Columbia University/Barnard J Street chapter, which claimed to oppose a BDS resolution at Barnard but refused to participate in efforts to oppose it. 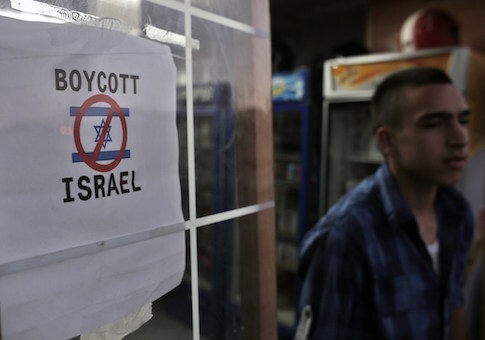 The group released a statement endorsing boycotts of Israel, declaring, "we do not oppose specific targeted boycott or divestment initiatives that recognize Israel's right to exist." The statement endorsed voting in favor of the boycott resolution: "If you plan to vote this week, at the very least make sure that whatever position you take is supported by rigorous fact-checking and independent inquiry." The Barnard BDS resolution passed. At the University of Maryland, a coalition of student groups mobilized to oppose a BDS resolution being promoted by Students for Justice in Palestine, which endorses terrorism against Israeli civilians and calls for the destruction of Israel. Before the vote, J Street wrote in a statement, "we support the writers of this bill in their effort to protect human rights in Israel-Palestine" but added that the group does "not support the bill in question." After the bill was voted down, J Street's University of Maryland chapter posted another statement declaring that while "this bill was not the proper response to human rights violations committed by Israel against Palestinians, neither is blindly celebrating the rejection of this bill." J Street then asked students to join its campaign attacking Israel for demolishing the homes of Palestinian terrorists, and promoted the screening of an anti-Israel film. A spokesperson for J Street did not respond to a request for comment on the matter. During the fall semester at the University of Michigan, after ten failed attempts in previous years to pass BDS resolutions, SJP successfully passed a divestment resolution. In the midst of an aggressive attempt by pro-Israel students to win the vote, J Street U refused to join the effort, did not state its opposition to the resolution, and did not criticize BDS. At a student government hearing about the resolution, a J Street representative began her three-minute speech by declaring herself "a dedicated activist against the occupation" and condemned "the Jewish community" because in her interactions with it, members "purposely left out criticism of Israel." In another successful BDS vote, this one in late April at George Washington University, J Street joined a coalition of students organizing to oppose the resolution, but used its place inside the group to advocate against speaking out against the BDS effort, and sought to prevent the formation of a consensus on strategy and messaging, according to sources familiar with the situation. "I was discussing our tactics for fighting anti-Semitism and BDS with a person affiliated with J Street," one pro-Israel student leader told the Free Beacon, speaking only on background to avoid stoking tensions on campus. "They advised me not to speak at the [student government divestment] hearing because my voice would not make a difference. They told another person that by speaking out against it they would have a target on their back and that it might not be worth it in the end." The BDS resolution at GW passed. Only on the day of the vote, April 23, did J Street's GW chapter release a statement opposing the BDS resolution, and only on the grounds that BDS "provides Israel's far-right government with the talking points they use to justify their fear-mongering tactics." J Street then defended the BDS movement from the charge that it is anti-Semitic, writing that the group "strongly condemns" claims BDS is anti-Semitic: "We reaffirm our belief … that one can be pro-BDS and not anti-Semitic." One senior official at a national pro-Israel group active on campuses told the Free Beacon, "J Street is unfortunately part of the BDS problem. J Street U chapters reinforce BDS messages and false accusations against Israel to students who know little about these issues, but are inclined to trust a group that calls itself ‘pro-Israel.' J Street consistently seeks to blur the bright line between acceptable political activism and the anti-Semitic BDS movement." Adam Kredo contributed to this report. This entry was posted in Culture and tagged Anti-Semitism, College Campuses, Israel, J Street. Bookmark the permalink.